← In a Pickle? Hard Cheese! Maple Syrup – It’s Not Just for Pancakes Anymore! Growing up in Southern Ontario, real maple syrup was usually not on our breakfast table, the option being good ol’ Aunt Jemima’s viscous “caramel coloured” stuff, full of chemicals with strange-sounding names. Not that real maple syrup wasn’t available: it was, however, you had to go to the producer’s farm, where most had small shops selling the syrup. Alternately, you could always count on finding small bottles of the real thing at the few shops at the then “Malton Airport”, which later became “Toronto International Airport”. Inevitably, our US family visitors would purchase a couple of bottles of real Canadian Maple Syrup to take home with them. After my folks retired, they bought some property in Moffat, Ontario, about 60 miles west of Toronto and several county roads away was a wonderful maple syrup farm. On visits to see them, we would drive by the maple trees lining the road and in late March and early April, each would be bedecked with a narrow tin bucket hanging from a spigot, which had been tapped into the trunk. 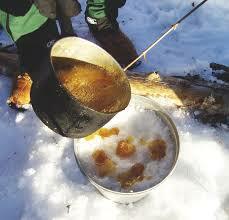 I was always awed by the fact that it takes approximately 40 liters of sap to produce just 1 liter of syrup! For you US folks, that’s 10.5 gallons of sap to make .26 of a gallon. No wonder it’s a tad more expensive than Aunt Jemima’s. 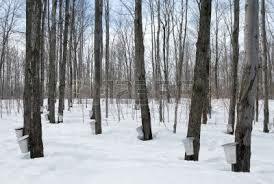 In addition, the season is very short: six weeks to collect the sap. 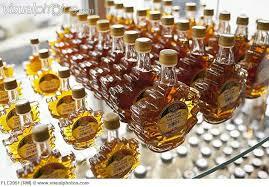 In 2013, Canada produced 10 million gallons of maple syrup. You could drown a lot of pancakes with that much! If you’ve never tasted real maple syrup, it’s much thinner than the mass-produced synthetic version and the taste of maple is not at all like the other stuff. It’s very rich, without being cloyingly sweet and there is a hint of smokiness to it. 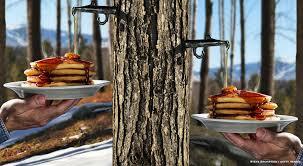 I’ve had maple syrup from Vermont, and it tastes completely different, yet I can’t exactly tell why. Canada produces 85% of the world’s maple syrup, in five provinces: Ontario, New Brunswick, Nova Scotia, Prince Edward Island, and Quebec (you know, the province that wants to be it’s own country). 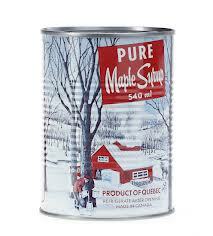 In addition to maple syrup, a variety of other products include maple butter, maple sugar, maple candy, etc. are produced. There’s nothing like munching on a maple shaped piece of real maple candy to send you running to the dentist. 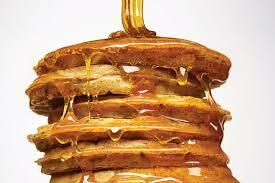 Maple syrup in Canada is sometimes referred to as “liquid gold” and no wonder. In 2011 and 2012, $18,000,000.00 of the sticky stuff was stolen from a distribution centre in Quebec. Eighteen individuals were later arrested (they probably left sticky fingerprints everywhere). At this time of year, with cooler days (and nights), and dwindling daylight, my thoughts turned to maple syrup and after checking several of my Canadian cookbooks, I found a wonderful recipe in “The Laura Secord Canadian Cook Book” (also see my post of March 1st, 2014 “Only in Canada, Eh? Pity”, which features a recipe for Canadian Butter Tarts). Like Robert Irvine of “Dinner Impossible” and “Restaurant Impossible”, I am not a big fan of combining sweet and savoury either, even though I know it’s very trendy and a lot of chefs hotly defend the combination. Nonetheless, I was intrigued by the “Chicken Breasts in Maple Syrup” recipe and decided to try it. Cook 2 to 3 minutes, until mushrooms are tender. Slit the thick portion of each chicken breast and insert one spoonful of ham mixture (I made the slit larger and used more stuffing). Pinch edges together to seal (I recommend toothpicks). Remove the chicken from the frypan. In the same frypan, add 1 cup thinly sliced onions and fry until slightly browned. Arrange the chicken breasts in a small casserole and top with onion. Spoon over each breast 1 tablespoon real maple syrup (I used several tablespoons for additional kick and because the breasts were so large – with apologies to Dolly Parton). Add ½ cup water to frypan to clean the pan and pour the contents over the chicken breasts. Bake, uncovered in a 350 degree oven for approximately 30 minutes, or until the juices run clear. Serve with additional warmed real maple syrup. To be fair, I was expecting to not like the sweet/savoury combination, but it worked well and tasted very pleasant. I might be brazen and try the combination again in the future. Pork and Maple Syrup? Yum. Ham and Maple Syrup? Sounds tasty. Liver in Maple Syrup? Not so much. This entry was posted in Cookbooks, Cooking, Cooking Technology, Recipes, Uncategorized, Vintage Cookbooks and tagged Canada, Canadian, cookbooks, Cooking, Laura Secord, Maple Sugar, Maple Syrup, Maple trees, Ontario, Quebec, Southern Ontario, Sue Jimenez. Bookmark the permalink.